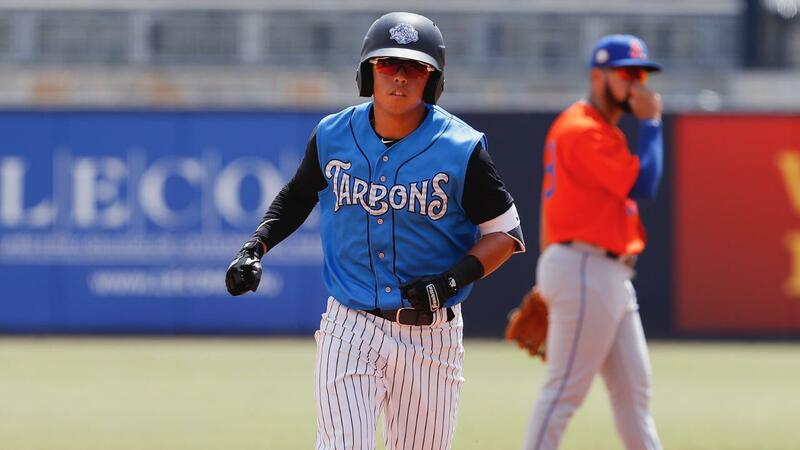 TAMPA, Fla. - The Tampa Tarpons fought until the end, rallying for five runs in the bottom of the ninth, but the St. Lucie Mets sealed a four-game sweep with an 8-6 win on Thursday afternoon at George M. Steinbrenner Field. An announced crowd of 4,440, the game was played in front of thousands of students from Hillsborough County Schools as part of Fifth Third Field Day. RHP Deivi Garcia made his second start of the season and began by needing only eight pitches in a perfect first inning, including his first two strikeouts. Garcia worked around a leadoff double in the second, adding two more punchouts before finding trouble in the third. Mitch Ghelfi drew a one-out walk and stole second. One out later, Hansel Moreno reached on an error at second base by Diego Castillo , putting runners on the corners with two outs. Moreno took off as Todd Frazier singled into left-center, scoring both Ghelfi and Moreno for a 2-0 lead. At 64 pitches, Garcia returned for the fourth and allowed back-to-back one-out singles by Cody Bohanek and Manny Rodriguez. Garcia picked off Rodriguez before getting Ghelfi to pop out, ending the frame. Garcia (L, 0-2) allowed two runs (neither earned) on four hits in four innings, walking two while striking out six. The 19-year-old threw 46 of 79 pitches for strikes and faced seven full-counts throughout his outing. Tampa batters were held hitless by St. Lucie starter Tony Dibrell until two outs in the fourth, when Oswaldo Cabrera and Dermis Garcia lined back-to-back singles. Dibrell got a flyout by Steven Sensley to strand the pair and continued to work a perfect fifth. The Mets added a run off RHP Jefry Valdez in the fifth when Blake Tiberi singled and later scored on a two-out hit by Quinn Brodey, giving St. Lucie a 3-0 lead. David Metzgar put the Tarpons on the board with a leadoff home run in the sixth. It was Metzgar's third-career home run and his first since August 15th, 2018 with Single-A Charleston. Dibrell (W, 1-0) retired the next two batters before leaving the game. The right-hander allowed one run on three hits in five and two-third innings, walking one while striking out five, and threw 47 of 76 pitches for strikes. Valdez struck out the side in a 1-2-3 sixth, but St. Lucie sent eight batters to the plate in the seventh. A bunt-single and a bloop-hit put Ghelfi and Tiberi aboard. After a sacrifice bunt by Moreno, Valdez intentionally walked Frazier to load the bases. Brody, Desmond Lindsay and Carlos Cortes followed with three-straight RBI singles, giving the Mets a 7-1 lead. St. Lucie loaded the bases again in the eighth, when Rodriguez walked, Moreno singled an Frazier walked with two outs, but Valdez got a lineout by Brodey to leave the bags full. RHPs Carlos Hernandez and Ryley Gilliam combined to retire seven-straight Tarpons between the sixth and eighth innings before Tampa rallied off RHP Joe Cavallaro in the ninth. Castillo doubled into the right field corner and scored on a base hit by Cabrera. One out later, Sensley doubled to right, and Donny Sands reached on a hit-by-pitch before Tyler Hill looped a two-run single into center. Sands then scored on a ground-rule double to left by Chris Hess , prompting a pitching change by the Mets. LHP Blake Taylor (SV, 3) entered and Hill scored as Metzgar reached on a fielder's choice, with Hess out advancing to third. Taylor then walked Matt Pita , putting the tying runs on base, but Castillo grounded out to third to end the comeback attempt. Cabrera (2-for-3, BB, RBI, R) had the lone multi-hit game for Tampa. Hill (1-for-3, BB, 2RBI, R) recorded an RBI for the third-straight game. Hess (1-for-4, 2B, RBI) extended his on-base streak to six-straight games. The Tarpons had five of their eight hits come in the ninth. Up next, the Tampa plays three games at Jackie Robinson Ballpark against the Daytona Tortugas over the weekend. RHP Glenn Otto (0-0, 2.25) is scheduled to start against RHP Andrew Jordan (0-0, 0.00) in the opener on Friday at 7:05 p.m. Live play-by-play audio will be available on the Daytona Tortugas Baseball Network. The Tarpons return home for a three-game series against the Bradenton Marauders, beginning on Monday at 6:30 p.m. On "Dog-On Mondays," fans can bring their dog to the ballpark with the purchase of a $2 dog ticket. Fans can also purchase an $8 lower reserved ticket that includes a hot dog, chips and a small drink (Special only available for purchase at the GMS Field Box Office).